In April 2018, a sample of Oriental hybrid lily (Lilium spp.) with distinctive symptoms was submitted to Fera Science Ltd. for diagnosis from a nursery in southern England by the Plant Health and Seed Inspectorate (PHSI). From the rusty-coloured, necrotic streaking on the leaves it was initially suspected that Plantago asiatica mosaic virus (PlAMV, genus Potexvirus) was the causal agent (Fig.1). 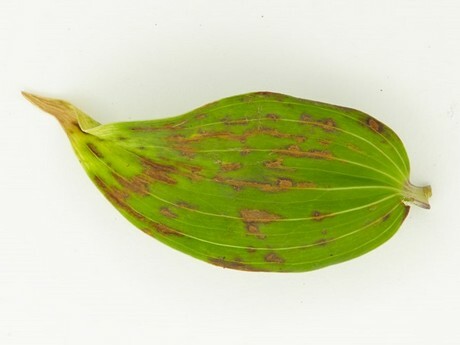 Figure 1: Lily leaf infected with Plantago asiatica mosaic virus showing rusty-coloured, necrotic streaking. Total RNA was extracted from the sample using magnetic beads and tested with a Verso 1-step RT- PCR Reddymix kit (Thermo Scientific, USA) using generic potexvirus primers, reverse Potex 4 and forward Potex 5 primers (Miglino et al., 2006). A 280 bp amplicon was purified and sent for sequencing (Genbank Accession No. MK005152). This sequence had 99% identity to PlAMV (KY807785). The result was confirmed using another RT-PCR assay with primers corresponding to the PlAMV coat protein gene sequence (Parrella et al., 2015), and the same PCR master mix as used previously, to generate a 1 kb amplicon (MK005151). Sequence comparisons confirmed that the virus was PlAMV with 99% identity to Accession No. KX245539. The infected plants identified in 2018 were grown in the UK from bulbs originating in The Netherlands, where PlAMV has previously been reported (Anonymous, 2010). A lily sample was diagnosed by Fera as being infected with PlAMV in 2012, (Anderson et al., 2012). These bulbs were grown in Spain and intercepted in the UK by PHSI, and the virus was not thought to have established. The lily samples in 2012 and 2018 were both from plants or propagation material originating in another country however the 2018 outbreak is the first report of PlAMV being detected from lilies actually grown on-site in the UK. PlAMV has been reported in several countries in Europe, the Americas, Korea, China and Japan and can infect natural hosts including Plantago asiatica (Russian Far East, Korea), Nandina domestica (USA), Rehmannia glutinosa (Korea) and Lilium and Primula spp (Japan), as well as a number of wild plant hosts (CABI, 2018). The extent of the 2018 outbreak was limited to a few glasshouse plants. Virus symptoms were not seen during site inspections in previous years. PlAMV is not regulated in the UK however necrotic streaking on the leaves makes infected lilies unsaleable. Losses of up to 80% have been reported in commercial cut-flower lily production in The Netherlands (Anonymous, 2010). Virus control is managed by the growers as this potexvirus can be transmitted both in contaminated soil and during the bulb washing processes via contaminated water (de Kock, 2013). Appropriate phytosanitary recommendations were put in place in the affected glasshouses to prevent further spread.